U.S. Soccer discloses female stars' email addresses. 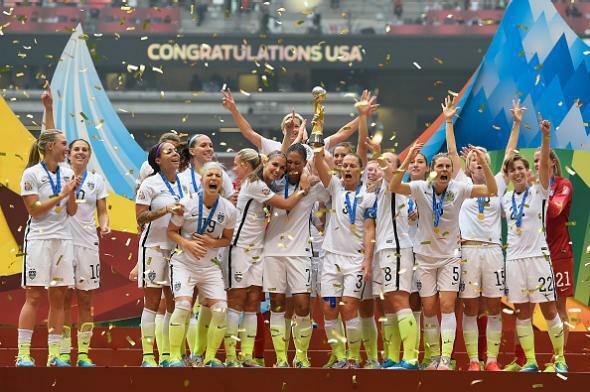 The U.S. Women’s National Team celebrates its victory in the 2015 World Cup final on July 5, 2015, in Vancouver, British Columbia. The exhibits accompanying the complaint included, among other documents, a list of 28 national team players and their home addresses, and unredacted email exchanges that disclosed the personal email addresses of some of the team’s top players. The players included some of the world’s most prominent athletes, including Rapinoe, forwards Abby Wambach and Alex Morgan, midfielder Carli Lloyd and goalkeeper Hope Solo. Beyond providing the information of individuals who might prefer not to be easy to contact directly even for legitimate reasons, the disclosure is unnerving given the history of criminal behavior by stalkers obsessed with female athletes. (The Times points to a Huffington Post interview with USWNT member Sydney Leroux in which she describes a male stalker who had to be removed from the team’s hotel during its post–World Cup victory tour; the paper has also written recently about similar predatory behavior by “fans” of women’s tennis players.) A representative of the union says that U.S. Soccer has apologized for making the addresses public and the players’ details have been redacted from the court website on which they appeared.